A word list filled with spooky words. 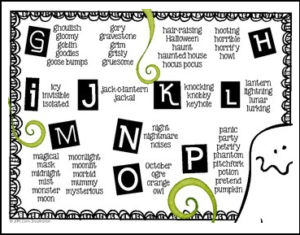 Great for writing projects during the Halloween season. Easy to print and add to any writer’s notebook, personal dictionary or word collector’s notebook. The adorable festive design also makes this an ideal display for your classroom writing center.